Yesterday was my oldest daughter’s 中学校の卒業式 (Junior High School graduation ceremony). After Spring vacation she’ll start her first year of high school (10th grade). I can’t believe how fast my kids are growing up! Today is 春分の日 (Spring Equinox). (Click here to read my short FAQ about this holiday). In Japan, both 春分の日 (Spring Equinox) in March and 秋分の日 (Autumn Equinox) in September are holidays, so we have the day off…and they’re days that many people pay a visit to their family gravesite. So, this morning we went to our family gravesite to leave flowers and pay respects. It’s called 墓参り (Haka-mairi). After that, we went to the 「アンパンマンとやなせたかし展」 (“Anpanman & Takashi Yanase Exhibit“) at the 日本橋三越本店 (Mitsukoshi Dep’t Store head store in Nihonbashi, Tokyo). やなせ・たかし (Takashi Yanase) is the artist who created the famous and extremely popular children’s cartoon character アンパンマン (Anpanman). This exhibit at the 日本橋三越本店 (Mitsukoshi Dep’t Store head store in Nihonbashi, Tokyo) is to celebrate やなせ・たかし (Takashi Yanase)’s 60 years of being an artist, the 40th anniversary of the アンパンマン (Anpanman) comic, and the 20th anniversary of the アンパンマン (Anpanman) TV series. アンパンマン (Anpanman) is about as popular as Mickey Mouse is in Japan. Maybe more. アンパンマン (Anpanman) is a superhero whose head is made of Anpan, which is a sweet-bean filled bun. He and his friends (most of whom also have heads made of various types of bread or some other healthy food) fight 「ばいきんまん」 (Germ man) and his partner 「どきんちゃん」 (Dokin-chan) who use various inventions and their army of 「かびるんるん」 (Mildew maniacs) to try and fill the world with germs. アンパンマン (Anpanman)’s weakness is if his head becomes wet…at which he’s helpless until the friendly baker 「ジャムおじさん」 (Jam-ojisan) makes a new head for him. 「ばいきんまん」 (Germ man)’s weakness is contact with soap. 「どきんちゃん」 (Dokin-chan)’s having an infatuation with アンパンマン (Anpanman)’s friend 「食パンマン」 (Sandwich bread man), much to 「ばいきんまん」 (Germ man)’s chagrin. アンパンマン (Anpanman) helping people in distress. Often by giving them a piece of his head to eat if they’re hungry. 「ばいきんまん」 (Germ man) gave a black heart to 「ロールパンナちゃん」, the older sister of アンパンマン (Anpanman)’s friend 「メロンパンナちゃん」 (Melon-panna chan). If she sees アンパンマン (Anpanman), her heart turns black and she betrays her friends…but when she sees her sister, her heart turns kind again. After she helps her friends, she always leaves to live in solitude for fear of her heart turning black again. アンパンマン (Anpanman) is very popular with young children in Japan and his image (as well as many of the other characters) can be seen on all sorts of items from toys to clothes to lunchbox sets to just about anything! When my kids were little, they loved アンパンマン (Anpanman). Last Spring, we visited the 「横浜アンパンマンこどもミュージアム」 (”Yokohama Anpanman Children’s Museum”). (Click here to read the post I wrote about it). Click here to visit the 「アンパンマンとやなせたかし展」 (“Anpanman & Takashi Yanase Exhibit“) website (Japanese only). Click here to visit the official Anpanman website (Japanese only). 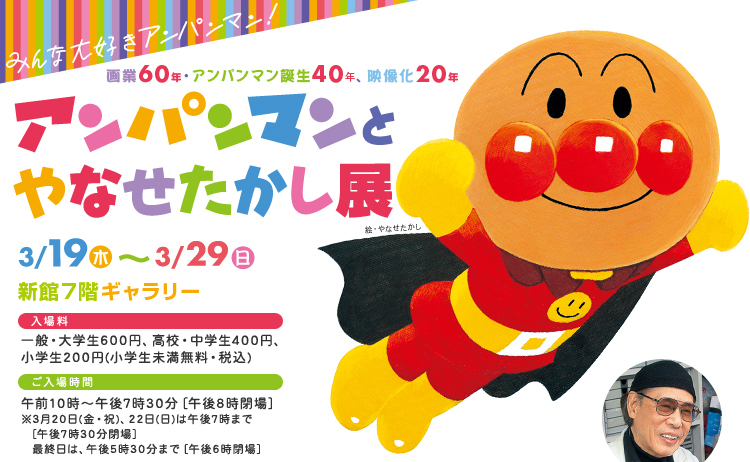 やなせ・たかし (Takashi Yanase), Anpanman’s creator, died last Sunday at the age of 94. Takashi Yanase, 1919/2/6 – 2013/10/13 , R.I.P. Thank you for a useful expression. 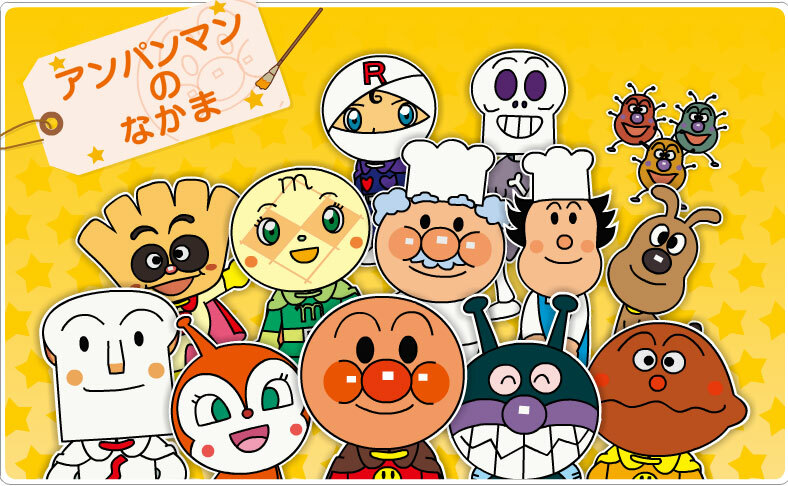 Which Anpanman characters are your kids’ favorites? My daugter loves メロンパンナ, because she loves　メロンパン. The author Yanase Takashi has good sense in naming his characters. Daikon-yakusha and Kakikukeko-chan are so nice! 「メロンパナちゃん」 is popular with young girls. ばいきんまん is certainly a villain in this story, but I prefer him rather than あんぱんまん! >ばいきんまん is certainly a villain in this story, but I prefer him rather than あんぱんまん! I like Baikinman, too. Also, Anpanman, Horror-man, and Daikon-yakusha. Do you watch the Japanese “Crayon Shin-chan” TV show in America?? >Firstly congratulations to your daughter for her graduation. The bread is anpan. The character is Anpan-man. Do you like anpan? Me, too! It’s good! I like Doraemon too. (He’s named after a Japanese food, too. Doraemon loves to eat dorayaki). Do you know Shin-chan or Chibi-Maruko? I like those cartoons more. Yes, you’re right. Thanks. I changed this post. Osamu Tezuka is often called “Japan’s Walt Disney”. Many people say that Disney got the story for “The Lion King” from his cartoon “Kimba The White Lion”…and didn’t credit him. I absolutely LOVE anpan!! love it when its served hot altho im not fussed if its cold 😀 I love eating dorayaki too especially one with red bean fillings ..over here they sell dorayaki with different fillings 🙂 and this is a new fact I know from you about Doraemon hehe. Yes, i do watch Doraemon from time to time, again its dubbed in my language 😦 hence the time to time bit… i need to get myself started with my Japanese lessons 🙂 I know Shin-Chan and Chibi Maruko. Chibi Maruko is hilarious ..why i just watched her this morning (english dubbed) 🙂 i learn alot from Maruko about the festivals, food and so much more. Do your daughters watch Chibi Maruko and Shin Chan? I agree, I think Disney ought to credit Osamu Tezuka for the Lion King, its rather obvious. Do they have Japanese anpan and dorayaki in your country? Are they popular? >Do your daughters watch Chibi Maruko and Shin Chan?